Did only bench press (19 reps) on Pro Day. Was unable to run due to injury recovery. Karl Joseph was a four year starter at West Virginia and perhaps the most dynamic, explosive, and gamechanging player on the defense (if not on the entire team). During a drill in practice, Karl tore his ACL and his stunning senior campaign was cut short after only 4 games. In those 4 games, though, he totalled 20 tackles (2 for loss), 1 sack, 1 fumble recovery, and 5 interceptions. And (if you can believe it), his onfield play was actually more impressive than his stats! Had Karl been injury-free and played thru his senior year, he’d likely have been in talks as a top-10 pick. Fortunately for the Raiders, Karl was available at #14 and Reggie had no reservations about drafting the potential superstar only 6 months after his surgery and no guarantee of when he would be at 100%. After the draft, Reggie McKenzie had no clear idea of exactly when and how much Karl would contribute to the team. Going into Training Camp, it wasn’t clear how recovered he was. The coaching and medical staff were being careful and taking it safely with him, working him slowly into the NFL regimen while keeping a careful eye on his health. In the pre-season, he did get a few starts, but the actual number of reps was minimal, giving him a nice taste for the game while also letting him continue to recover and strengthen his body. An NFL season is brutal enough for a rookie in an ideal situation, even moreso for a young man coming back from a major injury. In week three against the Tennessee Titans (approximately 11 months post-surgery) the team decided that it was time to set Karl loose. Physically and mentally, he was judged ready to step in to the starting lineup, becoming the latest of the 2016 rookie class that was contributing, joining Jihad Ward, Shilique Calhoun, Jalen Richard, DeAndre Washington, Vadal Alexander, Darius Latham (fellow rookie Cory James would also be inserted in the starting lineup at this time, bringing the rookie class “Key Players” count up to 8). In just two games, the young man has excited the entire Raider Nation and whet our communal appetite for more plays. And all the accolades that we’ve heard about him are showing up on the field. It is still far too early to come to any strong judgment about Karl as a player and any such effort is likely as much a Fool’s Errand as trying to assess Derek Carr’s rookie season after watching dumpoff pass after dumpoff pass. This is more about a taking an early look at Karl, getting a feel for what he may be capable of contributing to the team, and then establishing a baseline of the player for future reference. Over the balance of the season, we’ll have ample opportunities to study (and enjoy) his play and build an increasingly valid assessment of the player. So, here are some key aspects and skills that were visible and things to keep an eye on as we go forward. There is just so much to like about what Karl Joseph brings to the field and even in this early look at the player, we get glimpses of how he may help the defense. In the modern game, the prototype for the rangy sideline-to-sideline, deep covering Single Free Safety is stud Earl Thomas from Ken Norton’s former team. Thomas has the instincts, burst, and continuous speed to shrink deep passing windows and to erase mistakes by underneath coverage players. One of Karl’s great attributes is his ability to play as a deep safety and his skills and instincts lend a strong inclination to compare him to Earl Thomas. On this play, Karl and Reggie are playing both playing back and splitting the deep field (aka “Split Safeties” or “Cover 2 Shell”). This is a 4-Vertical concept out of the Trips Formation. WR #10 Chris Moore from the slot weaving in and out on his vertical route to get DJ Hayden turned around and then fades to the corner away from DJ. As he drops, Karl initially watches the inside; then as he recognizes Gilmore on the cross, he hands that off to Reggie Nelson (who picks it up) and turns his attention back in time to see Flacco making the throw to Chris Moore. As the ball arcs to the outside away from both DJ and Karl, we get a beautiful look at what it means for a defender to “flip his hips”. Karl’s hips turn from facing the inside to facing the sideline quickly and effortlessly, allowing him to break hard on the ball. He’s a split second away from the interception. This is a wonderful example of how much a safety can help CB play. DJ gets beaten by a nice route and if Karl had been caught up inside or was slow to react, this could result in a big play. When Karl bursts on the ball, he takes a great path to the ball that also serves to cut off the WR’s route. Karl COULD have taken a slightly more direct route (arcing farther back initially), but that may have set up a Jump Ball situation against 6’6″ Chris Moore. What Karl does is cut in front of Moore and then run the path to the ball, screening Moore away. This body position is amazing… if it were explicitly intentional. Again, it’s too early to make any definitive conclusions on Karl’s play, but keep an eye on how Karl plays deep coverage. Subtle plays like this may indicate fantastic football IQ and potential game-changing effects. WRs are constantly able to go up and make Jump Ball plays against Safeties and CBs, but Karl’s deep coverage skills and instincts may mitigate that. Karl tracks the ball very well. Safeties often have poorer ball-tracking instincts compared to offensive players, but here, Karl shows that natural sense to see the ball in the air and predict where it will land. That should lead to interceptions. So far, Karl has been used only minimally in man coverage (on Tight Ends) and the results were just fine. He surrendered receptions but made the tackle relatively quickly. This is an area where we really don’t know that much and a good deal of that is because so much of successful EXCELLENT man coverage is based on experience and film study. He’s still learning what kinds of routes the opposing TEs run and how they set down, how quickly they come out of their breaks, when they “jerk” away from their initial moves. For now, this is even more indeterminate than other aspects and is something to keep a close eye on. Many fans see a defender close in on a ball carrier and think only in terms of pure speed (eg., 40 yard time) while perhaps just as important or even moreso is how quickly the player assesses the play, reacts to the runner/receiver, and whether or not he takes false steps. A single misstep in the wrong direction can mean the difference between a squared-up hit and reaching for the ballcarrier. For a safety, this starts with putting himself in a good position to support to the play, both with regard to the location of the field as well as his general body positioning. This is where instincts, fundamentals, game prep, and Coaching (and coachability) converge. So far, Karl has been as good as you’d want. It seems like the young man is all over the field and when there’s a play near him, he always seems to be in a good position to make the tackle. On plays in front of him, he bursts like the proverbial cannonball and finishes off tackles. Any Raiders’ fan paying attention has been painfully aware of how much the QB bootleg and the quick throw to the Tight End has been destroying the defense since Pre Season Week 2 v Green Bay. Matt Ryan and the Atlanta Offense had an absolute field day with those plays and the Raiders’ defense looked as confused as a JV Squad. 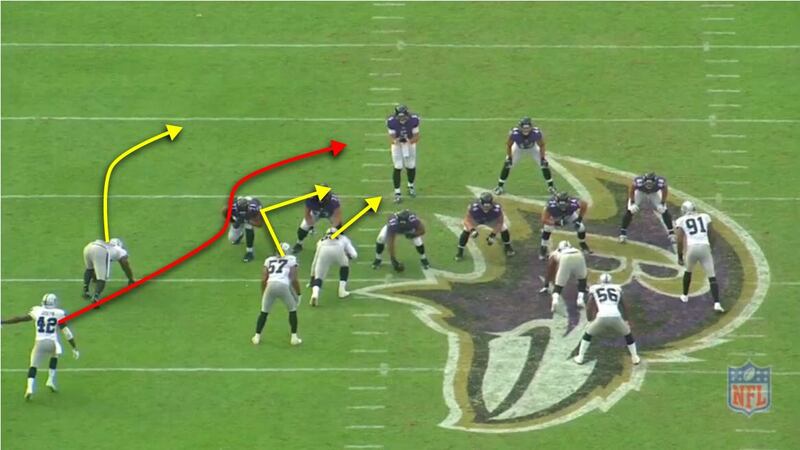 Early in the Week 4 game, Baltimore tried a similar play, but to a different outcome. For the first time in the 2016 season, the Raiders’ defense was able to handle the QB Bootleg play. 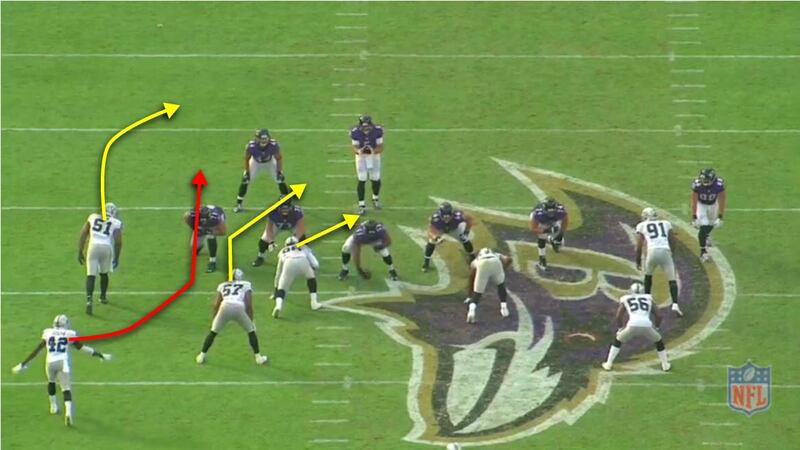 Flacco gives read-option look with RB Terrance West. Offensive line gives hard run action and gets the defense to flow strong to the right, notice Cory James has fully commited to the run action. On the keeper, Shilique Calhoun keeps backside discipline and attacks the QB. TE Dennis Pitta gives initial run block action and then breaks back to the outside. Karl is the only defender on that side of the field and if he bites too hard on the run, then this is a potential huge play for Pitta. But Karl also has to be aggressive enough to play run support in case of the handoff. Watch Karl’s fundamentals as he runs to the action; crucially, he keeps his body and hips square to the line of scrimmage as he continually scans the play to make sure he knows what’s happening. This reaction is so very impressive. When he recognizes Pitta breaking outside, Karl is able to efficiently break to wards him and is in ideal position (with squared-up leverage) to make the tackle. When he makes the play, he delivers the blow at the leg and wraps up. Dennis Pitta is 6’4″, 240 lbs. A “knock down”-style tackle probably won’t drop Pitta. The reaction is impressive because Karl goes from reading run to recognizing potential pass in a heartbeat and then gets to perfect position right away. This is impressive for any player, but it is especially eye-opening for a rookie. The Pro Game is very fast and even 2nd year players have difficulties with aspects of the game moving so quickly that they can’t process everything right away. This play shows Karl processing multiple things very quickly with no hesitation and playing very fast. It is not an understatement to say he looks like a veteran on this play. This play has burned the Raiders so much recently that surely the coaching staff has been emphasizing it. What we see here is Karl playing to that coaching and that’s very exciting. Football fans get enamored with Combine stats and the most commonly stated stat is the 40 yard time. For good reason, that kind of raw speed is just really exciting to watch. But mobility on the football field is more about running under control rather than running full out. So, you will rarely see a player on either side of the ball running to his full 40 yard time. One of my favorite players of the previous Raiders era was Tyvon Branch, but one of his major problems was that he tended to “play too fast,” which is to say he was always just a little bit out of control. When he made a play it was a bigtime splash play, but many times, by playing in FFWD mode, Branch would get out of position, lose containment, overrun a player, or miss a tackle. Michael Huff had similar problems. He would get out of position, attack ball carriers and then “Ambush Monkey”-leap at them, which would often result in misstackles. As a last-line of defense, this would often lead to big plays. Huff and Branch may both be superior raw athletes to Karl Joseph, but Karl shows football speed, discipline, and awareness that already makes him a more impressive football player (though time will need to bear that out). Something to keep an eye on and enjoy watching is how Karl controls and uses his speed. He seems to glide on the field and has the sense to get to where he needs to be in order to be available to make the needed play. By running under control and with his center of balance low and his feet underneath him, Karl’s is fully available to move laterally. Watch some players and as they run to a play, their upper bodies may lean out in front, their hips may lift up, their bases may narrow, they may sometimes get their hips overturned which can lead to getting their legs crossed. They can play fast, but their body positioning puts them at a loss if they need to maneuver. The previous play against Pitta is a nice example and here’s another play that shows off Karl’s control. WR Kamar Aiken catches an underneath pass and both DJ Hayden and Karl Joseph pursue to tackle him. The duo play Team Defense to make this play. DJ plays Aiken “outside-in” while Karl plays “Inside-Out”. This means that Hayden is going to attack Aiken to the outside and take away that half of the field while Karl plays support to the inside and makes sure that Aiken cannot get free inside. Keep an eye on Karl and his footwork. In particular, does he cross his feet/legs as he tracks the runner? His job is to maintain the inside leverage. Notice that Karl does get slightly out of position and commits upfield a bit (I think this will lessen as Karl gets more familiarity with his fellow defenders), but is in a good balanced position to adjust and finish off the tackle. And the pièce de resistance is how Karl’s long arms and strong hands just wrap up Aiken, ending the play. Tackling in the open field is very difficult. Opposing ball carriers spend their entire careers working on ways to defeat tacklers and in the NFL these guys have unbelievable athleticism, speed, explosiveness, strength. More often than not, if they get 1-on-1 situations in space, they will embarrass would-be tacklers. There are a few things that can mitigate this, however. The biggest being “Team Defense.” It is so important to have multiple defenders running to the ball and for each of them to understand what their respective responsibilities are. As in the previous example, it’s far easier for DJ Hayden to defend HALF a field and let Karl finish it off if the runner cuts to the other half. Team Defense turns Good tacklers into Great ones. Karl has shown great fundamental tackling, but what is perhaps more exciting is how he seems to understand relative positioning on the field and how to play leverage. He seems to have some innate sense of space and how to find the optimum place to make tackles; it is like the reverse ability of running backs like Darren Sproles who seem to naturally find open space in a crowd. Here is an excellent example when he and Cory James combine to force a fumble (to DJ’s infinite glee, not shown). The Raiders’ run defense had another breakdown and this time lets Ravens’ RB Terrance West explode up the middle and clear the 2nd level. Karl Joseph is the last line of defense. He drops down from the deep safety position and as Karl makes the tackle, fellow rookie Cory James comes in with a nice hit to dislodge the ball. Fumble recoveries are unpredictable and this time the Ravens get it back. This looks like a routine play on Karl’s part. He’s supposed to make the tackle when the runner breaks loose. But, again, tackling in the open field is a difficult task and here, not only does Karl make it look easy, but it turns into a potential big defensive play. There are a couple of things to pay attention to and that indicate why we fans may be growing excited so soon. Terrance West should have a two-way go against Karl Joseph. He’s bursting past the Cory James and Reggie Nelson and Karl has to defend both left and right sides, depending on which was West wants to go. This image could be in the “How to Tackle” textbook. Breaking down in front of the runner, wide base, knees bent, body centered in the “Universal Athletic Position.” He’s in a perfect position to execute a form tackle. A closer inspection reveals something else, though. Take note of Karl’s leverage. He is NOT perfectly squared up on West, instead, he has taken a slight inside position. Notice that his helmet is lined up with West’s right shoulderpad. This is important because of what we mentioned earlier : Team Defense. By positioning, Karl has dictated which way West will cut. To West’s left is Cory James, DJ Hayden, and further back, Khalil Mack. To the right is Reggie Nelson. In an instant, Karl has set up to funnel West into the direction of the more dangerous help defenders. This work starts well before Karl the moment shown in this still image. His angle dropping down from his deep position dictates how well he can set up; if he takes a poor angle to begin with, there’s no way he could get into such a perfect position. Cory James deservedly gets the credit for banging the ball and jarring it loose, but Karl’s instincts forced West into harm’s way. At first glance, it’s a nice tackle and a great hustle play by James. On further inspection, we may be getting our first taste of Karl’s ability to play Team Defense and to elevate the play of the defenders around him. This is something really exciting and something to keep close tabs on. If big plays are often occurring around Karl, it’s likely because of subtle things like this. In Week 3 at Tennessee, when Karl Joseph blitzed Marcus Mariota, it was shocking how quickly he accelerated off the edge, saved at the last moment by DeMarco Murray’s blitz pickup. In Week 4, Karl again showed his blitzing prowess and may have shown DC Ken Norton Jr that Karl is a definite weapon; in fact, he’s just too good at blitzing that it would be a waste to NOT use him that way. In the 4th quarter, on the Raiders’ final defensive stand, Karl Joseph blitzed three consecutive plays and he gave us a reason to get excited. This is a 5 man rush with both Cory James and Karl Joseph blitzing. On the opposite side, Shilique Calhoun drops into coverage. 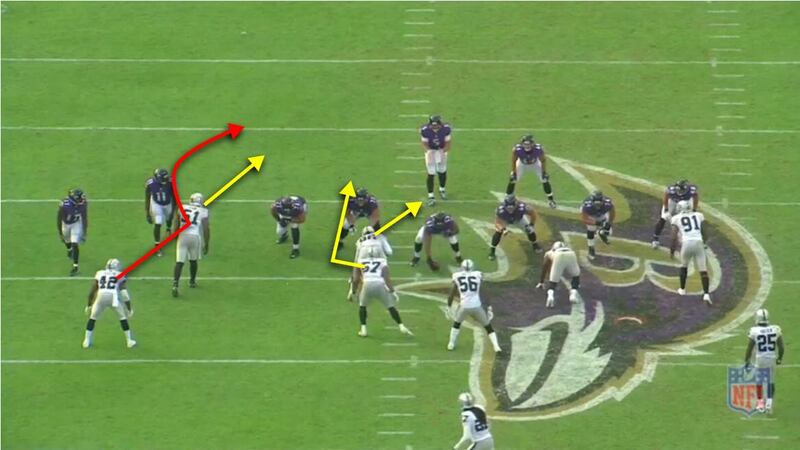 Denico Autry inside will slant down while Bruce Irvin will loop wide to the outside; this separates the blockers. The RB takes the most dangerous blitzer, Cory James. James attacks straight upfield and then breaks hard to the inside, drawing the RB to completely clear the backfield. This leaves Karl with a clear path. Notice Karl’s path. He follows Cory James as if James were a Lead Blocker. Karl takes an inside step and then runs right behind James. It makes it harder to pick up Karl and hard for Flacco to see him. Then at the right time, Karl breaks free and attacks right up into Flacco. He doesn’t get the sack, but he does provide a physical presence in his face as well as tipping the ball, which nearly gets intercepted by Reggie Nelson. It’s a similar blitz design with Cory and Karl blitzing and Shilique dropping into coverage. This time Karl recognizes that the B-Gap is protected (by both the LG and the RB) and so he runs behind Bruce and then rushes to the outside. Unfortunately, Bruce gets chipped by the WR; he spins in place and is unable to engage/draw the RT so when Karl rushes to the outside, there’s a blocker waiting for him. Ideally if Bruce were able to get into the RT, then Karl may come free to the outside. Again, take note of how Karl hides behind another rusher, this time Bruce Irvin and how effortlessly he seems to bend his path around. It’s the same blitz again. As in the first blitz, Karl attacks the B-Gap using Cory James as a lead blocker. With the RB giving extra attention to Khalil Mack on the opposite side (lined up as the 4 technique DT), Karl comes completely free. This was the final play of the game, the play that resulted in the DJ Hayden / Reggie Nelson pass breakup. What stands out about Karl Joseph blitzing is his sense of how to use space and his fellow players. He has a great sense of what the blockers are doing and where the free space is going to be and he is like a guided missile that seeks out the clear lane. Leadership, intelligence, instincts, and general football IQ really distinguish the the Great Ones from everyone else. It’s rare to be able to blend elite athleticism with these “intangibles” and when it does happen, you have players like Troy Polamalu, Ed Reed, Ray Lewis, etc. It’s way too early to put Karl’s name among those guys, but it’s not too early to watch him and see if he shows signs of having these traits. On this play, Cory James is a little unsure of where to line up and Karl is getting him to look for the QB sneak. As a four year starter in College and a Defensive Captain in his senior year, Karl is confident and used to leading and here he’s not shy about adjusting Cory James. Karl got Cory where he needed to be. Karl may understand the defense and be able to set and adjust the backend sooner rather than later. The leadership and coordination vacuum that is currently in place at the LB level may have an answer at the secondary level in Karl Joseph. Perhaps the biggest thing is Karl’s absolute love of the game. This is impossible to really quantify, but it’s clear that he’s been chomping at the bit to get on the field and that he really has wanted to get on the field. He’s a young player finally getting on the field after being held back for a couple of games. It would be very natural for him to be excited and to make many of the mistakes of youthful exuberanc and impatience : Being over-aggressive, jumping on first action, overpursuing plays, going for Killshot tackles instead of wrapping up. In his first couple of games, Karl Joseph had more in common with a savvy veteran than a rookie finally playing for the first time. This really bodes well for his future. For the many Raiders’ fans that have had to deal with athletic freaks who were not fundamentally sound football players, Karl Joseph is a refreshing change of pace. He’s a guy who has such fantastic fundamentals and great instincts that he makes the game look easier than it should be. At the time, it sounds like typical sound-bites to hype a first round draft pick. Now, two games into his career, these are the exact same qualities that show up on film study. If anything, those quotes undersell just how much of a pure, natural football player Karl Joseph is. We’ve taken a quick look at many of these skills and qualities, marking them down as our baseline look at him. He’s already exciting and impressive, but over the course of the next couple of years, this young man is going to develop and grow; he’s going to get smarter, stronger, and more in sync with his secondary mates and if all goes to plan, he’s going to grow into a powerhouse of a player with Ken Norton in the enviable position of figuring out new ways to use all his myriad talents. Perhaps the biggest difficulty will be how to take advantage of so many great abilities. Typically, we call well-rounded players “Jack of All Trades”, because they are good at many things but not excellent at any single thing. Karl Joseph may have to be called “Ace of All Trades” because he excels at just about every aspect of the game. Of everything that he does, the most intriguing part of him is how he improves the play of the players around him and how he can affect the game in many ways. It is going to be a lot of fun following Karl Joseph. Excellent Article. I can’t find anything close to this anywhere else. Keep em coming. As a WVU fan, I can say that what you have described in Karl’s limited action in Oakland is what we saw from him during his time at WVU. He seemed to improve by an order of magnitude year over year and we were all devistated that an injury cut what would have been a senior year Tour de Force short. I have not witnessed a better nose for the ball and more willingness to lay the wood to ball carriers, I am not sure that there has been any man more suited to be a Raider than Karl Joseph. He and Bruce Irvin are 2 of the WVU fanbase’s all time favorites and Oakland landed a ton of new fans with their arrival to the Raiders. Great article, I look forward to reading more from you!